Despite the damage to the GOP caused by his older brother George, former Florida Gov. Jeb Bush is considered a rock star among Republicans in the state. His big brother helped drag the GOP to two consecutive thrashings at the polls, but former Gov. Jeb Bush’s prospective Senate candidacy is nevertheless getting a hero’s welcome from Florida Republicans. To them, President George W. Bush’s record-low approval ratings are irrelevant, and the idea of Bush fatigue is immaterial. In the wake of the announcement by Sen. Mel Martinez (R) that he will not seek a second term, GOP sentiment is coalescing around the counterintuitive idea that the best way to keep the seat in Republican hands is to place a Bush atop Florida’s GOP ballot in 2010. While Bush hasn’t yet committed to running for the open Senate seat—in an email Tuesday he told Politico, “I am considering it”—Florida Republicans, including other potential aspirants for the seat, were effusive about a potential Bush bid. Diaz-Balart notes the high level of support Jeb Bush enjoyed upon leaving office after two terms, which stands in stark contrast to his brother, whose job performance was disapproved by nearly two-thirds of those surveyed in the latest Gallup tracking poll. If there is a degree of Bush blowback, Republicans interviewed for this story agreed, it’s likely to be fleeting. The Republican optimism is in part driven by the notion, prevalent among Republicans but also acknowledged by some outside the party, that voters will make sharp distinctions between the two Bushes. Their widely divergent responses to natural disasters that confronted their administrations are at the heart of this thinking. While the president is forever saddled with the ineptitude of the federal government’s response to Hurricane Katrina, Jeb Bush is lauded for his hands-on role in confronting several highly destructive hurricanes. Republican Congressman Adam Putnam, who has drawn mention as a possible candidate for the Senate seat, agreed that hurricane response was a significant part of Jeb Bush’s legacy because he was decisive, empathetic and clearly in command. “I think that his connection to Floridians became very strong as a result of that hurricane season. He was seen as someone who not only brought intellectual heft but someone who understood loss and could comfort people in need,” said Putnam. There is little evidence to suggest voters have ever held one Bush accountable for the other’s actions or confused the two in any way. In 2002, for example, two years after the polarizing presidential election in which Florida played a controversial role in the determining the outcome, Jeb Bush won re-election against a formidable Democratic opponent by an even greater margin than when he won the seat in 1998. 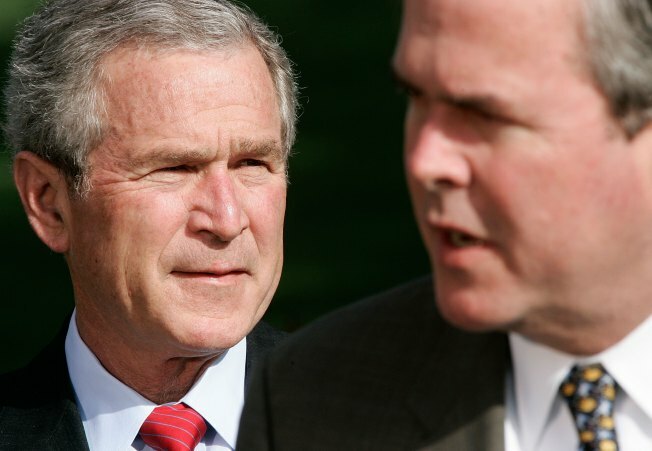 Still, given the deep animus toward the policies of the Bush White House, Democrats are already beginning to draw a straight line between Jeb Bush and his older brother. “Jeb Bush takes George Bush’s hyper-partisan brand of politics to the next level, and Floridians will reject it,” said Democratic Rep. Kendrick Meek in a statement. Democratic Rep. Debbie Wasserman Schultz noted that the Bush brothers had several traits in common.